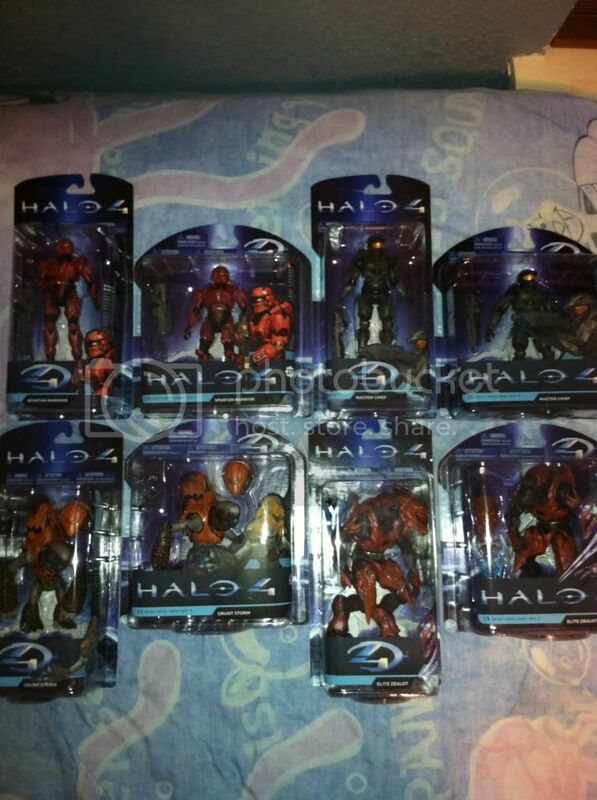 McFarlane Toys Halo 4 Series 1 action figures were released in August 2012. Carded figure came in two different types of packaging. The individual figures are packed with the traditionally shaped cards, but GameStop carries figures in much slimmer cards to save space. This Master Chief figure is based off of Master Chief's new appearance in Halo 4. It comes with an MA5D Assault Rifle. This figure was first released in the 2012 San Diego Comic Con. Prototype of the Master Chief figure. The Elite Zealot figure comes with an Energy Sword. Like previous McFarlane Elite figures, its helmet is removable. Its redesigned hand makes it impossible for the figure to hold the Energy Sword firmly and there's no back storage. The Elite's bodysuit also seems to include gloves. The Elite Zealot figure in package. The Storm Grunt figure comes with a Plasma Pistol and a removable helmet. The Storm Grunt figure in package. This Spartan IV has red GEN2 Warrior armor and comes with a Sniper Rifle. The red Spartan Warrior figure. The red Spartan Warrior figure in package. The Halo 4 Cortana figure now has articulation, unlike the Halo 3 variants. It comes with a stand, and interchangeable hands, including one that is touching a holographic screen. It was released as a later wave of Series 1. The figure comes with a bonus Master Chief Micro Ops figure. The Cortana figure in package. The Promethean Crawler figure was released as a later wave of Series 1. The Crawler figure in package. The Promethean Watcher figure has a stand to give it the appearance of it floating. It was released as a later wave of Series 1. The Watchers stand consists of a clear, round piece of plastic that attaches to the ring on its back. When disassembled, the Watcher figure can fit inside the Promethean Knight figure. The Watcher figure in package. This Spartan has blue Soldier armor and a Battle Rifle. It was released as a later wave of Series 1. The blue Spartan Soldier figure. The blue Spartan Soldier figure in package. This box set includes a Master Chief figure and a Cryotube. The figure and the interior of the Cryotube are covered with frost. The Cryotube can open and close and hold the figure. The set also includes an M363 Remote Projectile Detonator. The Master Chief in UNSC Cryotube box set. The Master Chief in UNSC Cryotube box set in package. This box set includes all four individual carded figures from the first wave and their accessories. The only change is that the Spartan Warrior is blue, instead of red. It is a Target exclusive. The Collector Boxed Set figures. The Collector Boxed Set figures in package. This box set includes unchanged figures of the Master Chief, the Crawler, and the Watcher, along with an exclusive purple Spartan Soldier figure. It is exclusive to Target and Best Buy Canada. The Collector Boxed Set 2 figures. The Collector Boxed Set 2 figures in package. This box set includes unchanged figures of the Master Chief, Cortana, the Crawler, and the Watcher, along with an exclusive orange Spartan Soldier figure. The orange Spartan Soldier figure. The 5-Figure Boxed Set figures. The 5-Figure Boxed Set figures in package. This box set includes a single Promethean Knight figure. It can store the Watcher figure in its back. The Knight figure in package.